Chan, R. Y. (2016, July). Engaging Young Alumni: Millennials Participation in Homecoming Events at Indiana University, Bloomington. Featured conference speaker presented at NASPA Student Affairs Fundraising Conference, Columbus, OH. Chan, R. Y. (2016, March). Shaping a Vision for Higher Education Philanthropy: What We Know about the Relationship Between Student Affairs and Institutional Advancement Offices. Poster presented at NASPA Annual Conference, Indianapolis, IN. Chan, R. Y., Sera, A., Akada, T., Saba, A., & Pooja, S. (2016, March). The Role, Function, and Purpose of Education: An International Comparative Perspective. Invited Group Panel presented at 60th Annual Comparative and International Education (CIES) Conference, Vancouver, Canada. Chan, R. Y. (2015, November). Can Philanthropy and Fundraising Fix Our Inequality? : Exploring Philanthropy’s Influence on U.S. Higher Education. Scholarly paper presented at the Association for the Study of Higher Education (ASHE) Annual Conference, Denver, CO.
Chan, R. Y. (2015, August). Philanthropy in the Social World: Utilizing Organizational and Sociological Theory for Research on Higher Education Philanthropy. Roundtable Paper presented at American Sociological Association (ASA) Annual Meeting, Chicago, IL. Chan, R. Y. (2015, July). The Future of Higher Education: Examining the Goals and Values for Pursuing a College Degree. Working Group Paper presented at the 91st Annual Society for Values in Higher Education (SVHE) Conference, Bowling Green, KY.
Marina, B. L., Pazurek, A., & Chan, R. Y. (2015, March). 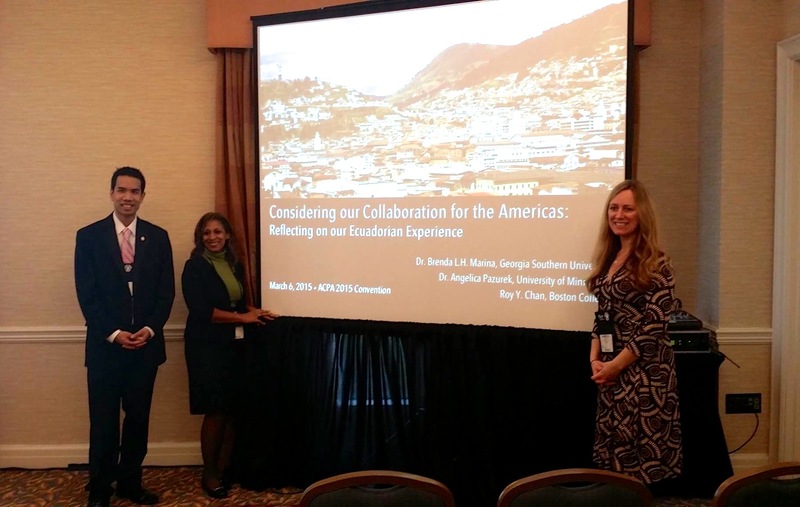 Considering our Collaboration for the Americas: Reflecting on our Ecuadorian Experience. Sponsored Program Paper presented at the ACPA 2015 Annual Convention, Tampa, FL. Chan, R. Y. (2015, March). Challenges Facing China’s GaoKao Reform by 2017: English Teachers’ Perception of the National College Entrance Examination in Tibet and Inner Mongolia. Paper presented at Comparative & International Education Society (CIES) 2015 Annual Conference, Washington, D.C.
Chan, R. Y. (2014, November). “Tuning” American Higher Education: Aligning Institutional and Student Goals of Completing a College Degree. Roundtable Paper presented at ASHE 2014 Annual Conference, Washington, D.C.
Chan, R. Y. (2014, May). Chinese Students Learning and Living Experience at two “World-Class” Research Universities in East Asia. Poster to be presented at Going Global 2014 Conference, May 1, 2014. Miami, FL. Chan, R. Y., Brown, G. T., & Ludlow, L. (2014, April). A Concerning Misalignment? : Comparing Institutional and Student Perspectives on the Purposes and Goals of Completing a U.S. Bachelor’s Degree. Roundtable paper to be presented at American Educational Research Association(AERA) Annual Meeting. Philadelphia, PA.
Chan, R. (2014, March). What is the Purpose of Higher Education? :Exploring Student and Institutional Perspectives for Completing a U.S. Bachelor’s Degree in the 21st Century. Paper presented at the inaugural 21st Century Academic Forum at Harvard University. Cambridge, MA. Chan, R. (2013, November). What is the Purpose of Higher Education? : Comparing Student and Institutional Perspectives for Completing a U.S. Bachelor’s Degree in the 21st Century. Roundtable paper presented at the Association for the Study of Higher Education(ASHE) 2013 Annual Conference. St. Louis, MI. Chan, R. Y. (2013, November). China’s Quest toward “World-Class” Universities in the Age of Uncertain Times. Paper presented at Comparative & International Education Society(CIES) Northeastern (NE) Regional Conference. Center for International Education, University of Amherst, MA. Chan, R. Y. (2013, October). Is China Striving for Sustainability in Higher Education? : A Case Study at two aspiring “World-Class” Research Universities in Hong Kong and Shanghai. Paper presented at the annual Association for the Advancement of Sustainability in Higher Education(AASHE) 2013 Conference. Nashville, TN. Chan, R. Y. (2013, May). Assessing Graduate Attributes and Students’ Generic Skills in the Asia-Pacific. Discussion group presented at Association for Institutional Research(AIR) Annual Meeting. Long Beach, CA. Chan, R. Y. (2013, April). The Road to Academic Excellence: Developing an Effective College Environment for Students’ at aspiring “World-Class” Research Universities in China. Paper presented at American Education Research Association(AERA) Annual Meeting. San Francisco, CA. Chan, R. (2013, March). Students’ Experience at World-Class Universities in China: A Comparative Case Study of The University of Hong Kong(HKU) and Shanghai Jiao Tong University(SJTU). Poster presented at the 57th Annual Conference of Comparative & International Education Society(CIES). New Orleans, LA. Chan, R. Y. (2013, January). Students’ Experience at World-Class Universities in China: A Comparative Case Study of The University of Hong Kong(HKU) and Shanghai Jiao Tong University(SJTU). Poster presented at the 11th Annual Hawaii International Conference on Education(HICE). Honolulu, HI. Chan, R. Y. (2012, May). Students’ Experience at World-Class Universities in China: A Comparative Case Study of The University of Hong Kong(HKU) and Shanghai Jiao Tong University(SJTU). Poster presented at the NAFSA: Association of International Educators 64th Annual Conference and Expo. Houston, TX. Chan, R. Y. (2012, April). The Effects of College Environment on Students’ Learning and Living Experience at World-Class Universities in China: A Comparative Case Study of The University of Hong Kong(HKU) and Shanghai Jiao Tong University(SJTU). Paper presented at 56th Annual Conference of Comparative & International Education Society(CIES). San Juan, Puerto Rico. Chan, R. Y. (2014, June). Can China Keep Rising in the Age of Globalization? : Chinese Students’ Experience at two “World-Class” Universities. Paper to be presented at the inagural Chinese American Educational Research and Development Association (CAERDA). Xi’an, China. Chan, R. Y. (2014, March). The Impact of High-Stakes College Entrance Examinations on Rural Students’ Access to and Success in Higher Education at Lincang, Yunnan province, China. New Scholars Fellow paper presented at the 58th Annual Comparative & International Education(CIES) Conference. Toronto, Canada. Chan, R. Y. (2013, October). Can China keep rising in the age of globalization? : Chinese students’ learning and living experience at two aspiring “world-class” research universities in East Asia. Paper presented at the International Conference on Higher Education Student Learning and Development in a Globalizing Time. Beijing, China (Institute of Higher Education, Tsinghua University). Chan, R. Y. (2013, January). Fostering a Dynamic College Environment at World-Class Research Universities in China: A Comparative Case Study of The University of Hong Kong(HKU) and Shanghai Jiao Tong University(SJTU). Paper presented at the 6th World Universities Forum. Vancouver, British Columbia, Canada. Chan, R. Y. (2012, July). Developing an Effective College Environment for Students’ at World-Class Universities in China. Paper presented at the 8th Biennial Comparative Education Society of Asia(CESA) 2012 Conference. Chulalongkorn University – Faculty of Education, Bangkok, Thailand. Chan, R. Y. (2012, June). American Students’ at aspiring World-Class Research Universities in India. Paper presented at 2nd IFEHE National Conference on Excellence in Higher Education of the International Forum for Excellence in Higher Education. Indian Institute of Technology(IIT) – Delhi, New Delhi, India. Chan, R. Y. (2015, April). Studying Philanthropy and Fundraising in Higher Education: A Proposed Conceptual Model. Roundtable paper presented at the 20th Annual Harvard University Graduate School of Education(HGSE) – Student Research Conference(SRC). Cambridge, MA. Chan, R. Y. (2014, March). What is the Purpose of Higher Education? : Exploring Student and Institutional Perspectives for Completing a U.S. Bachelor’s Degree in the 21st Century. Roundtable paper presented at the 19th Annual Harvard University Graduate School of Education(HGSE) – Student Research Conference(SRC). Cambridge, MA. Chan, R. Y. (2013, April). What Can North Americans Learn from East Asia’s Impact on Global Higher Education? : Lessons Learned from Chinese Students’ Experiences at two World-Class Research Universities in China. Panel presented at the 18th Annual Harvard University Graduate School of Education(HGSE) – Student Research Conference(SRC). Cambridge, MA. Chan, R. Y. (2013, February). What Can North Americans Learn from East Asia’s Impact on Global Higher Education? : Lessons Learned from Chinese Students’ Experiences at two World-Class Research Universities in China. Paper presented at the Inaugural Penn Symposium on Contemporary China (PSCC). Philadelphia, PA.
Chan, R. Y. (2012, March). The Effects of College Environment on Students’ Learning and Living Experience at World-Class Universities in China: A Comparative Case Study of The University of Hong Kong(HKU) and Shanghai Jiao Tong University(SJTU). Paper presented at the 7th Annual New York University(NYU) Steinhardt International Education Conference. New York City, NY. Chan, R. Y. (2013, Fall). Higher Education Policy and Planning Inaugural Summer School: Lessons Learned from Shanghai Jiao Tong University – Graduate School of Education. Invited presentation at Boston College – CIHE, November 12, 2013: Chestnut Hill, MA, USA. Chan, R. Y. (2014, 2013, 2012, Fall and Spring). The Art of College Admission: What High School Students Need to Know about the College Application Process. Invited presentations at Boston College – Splash, April 6,2 014, November 10, 2013 and November 4, 2012: Chestnut Hill, MA, USA. Chan, R. Y. (2012, Fall). Global Trends and Challenges in Chinese Higher Education: Towards “World-Class” Status by Year 2020. Invited presentation at Boston College – CIHE, November 5, 2012: Chestnut Hill, MA, USA. Chan, R. Y. (2012, Summer). The Road to Academic Excellence: An Overview of Chinese Higher Education towards “World-Class”. Invited presentation at Sung Kyun Kwan University, July 17, 2012: Seoul, South Korea.